Houses and heavy items are individually priced. 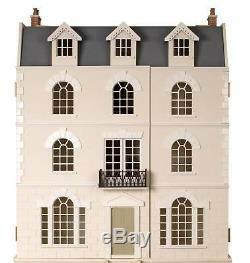 Melody Jane Dolls House Large Luxury Georgian Dolls House MDF Flat Pack Kit 1:1. 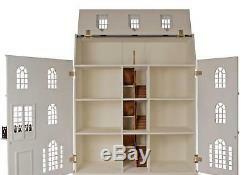 Large Luxury Georgian Dolls House MDF Flat Pack Unpainted Kit 1:12 Scale MJ19. British made - MDF - Flat packed and unpainted ready for you to decorate in the style you choose. This item is suitable for new or experienced collectors and for children over 7 years of age with adult supervision. Stair railings, banisters and newel posts. 3 Room basement option as in picture 3 can be bought in my shop MJ02A. (W x D x H) 750 x 380 x 930 mm (29.5 x 15 x 36.5 inches). Hall/Stairwell is 150mm (6 inches) wide. PLEASE NOTE: Northern Ireland, Highlands and Islands and any non UK mainland addresses are not included in the U. Detailed scale model for adult collectors. SKU: DH019 / Barcode: 8800159407383. Over 4,500 Stocked Items With items added every day, you're bound to find what you need! We've got you covered! The item "Melody Jane Dolls House Large Luxury Georgian dolls house MDF Flat Pack Kit 11" is in sale since Friday, November 10, 2017.